The Eastern North America looks like a naturalist's nightmare on World population density or industrial development maps. Few people realize that it is one of the most interesting parts of our planet not only for a fast food addict, but also for a biologist. Even among the locals, it is a widespread belief that the East is just one huge megalopolis with few small parks inside, that you need to visit the West to see any wild and unspoiled Nature. Fortunately, it's not true. smallest centipede, was recently described from a park here. Although vast parts of the East are now converted to smog-wrapped cities, or paved over as freeway junctions, there is enough land in between for some wilderness. As the plague of large-scale logging have been exported to Canada and the Third World, the forests of the East are now recovering, and so does the wildlife. Unfortunately, many key components of Eastern ecosystems, such as red wolf, Pennsylvania bison, passenger pigeon, and American chestnut, have been lost, some of them forever. A common, but heart-breaking sight in the forests are young chestnuts sprouting from old stumps. They are all doomed to be killed by introduced chestnut blight fungus (Cryphonectria parasitica) before reaching maturity. Chestnut used to be the dominant tree in the East, and an important food source for many animals. Some other trees, such as American elm or white pine, have also been wiped out in many areas by introduced diseases or logging. Barrens, New Jersey. All these tragic events are even more sad because they happen in one of the most precious parts of our planet. Eastern US and China are the main areas where the diverse flora and fauna of Tertiary Period still survive. 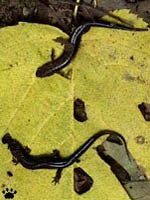 The East has more species of salamanders, turtles, pines, and carnivorous plants, than any other place in the World. 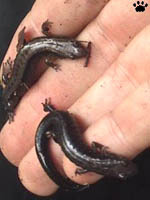 Lungless salamanders, left to right: four-toed (Hemidactylius scutatum), slimy (Plethodon glutinosus), mountain dusky (Desmognathus ochrophaeus), red-backed (P. cinereus). Pennsylvania. Manteo, N. Carolina. Freshwater fauna is particularly interesting. Almost every river of the seaboard between Chesapeake Bay and Mexican border has its own species of fish and mussels. Some of these endemics are very beautiful, and many are endangered, but they get little attention from environmentalists, not to mention general public. Torreya State Park, Florida. This small park (right) is home to many of unusual creatures and some endemic trees. But the only reason tourists visit it is because it was the location of two Confederate cannons during the Civil War. Missouri. Well, getting little attention is not always bad. Turtles and tree snails, for example, get too much - some have been almost wiped out by collectors. Turtles of the East range from tiny, bizarre and stunningly beautiful map turtles (Graptemys), to giant snapping turtles (Macroclemys), known to kill little children. Seeing them in the wild takes lot of patience. You can spend hours approaching their basking logs slow enough to avoid scaring them away. Tuocuonga, Indiana. Some are completely aquatic, like snapping and softshell (Trionyx) turtles, almost never leave water and can only seen by diving; others are more terrestrial, like wood (Clemmys insculpta) and box turtles. Wood turtle, Cape Cod, Massachusets. 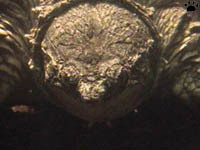 Diamondback terrapin (Malaclemys terrapene) inhabits sea coasts, and seldom enters fresh water. 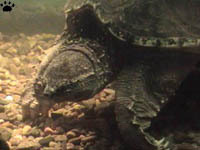 Good places to see many turtle species are Beaver Lake area, Tennessee, northern parts of the Everglades, Florida, Colorado Bend, Texas, and some coastal rivers in Gulf States, Florida Panhandle and North Carolina. Minnows (Notropis cummingsae, Cyprinella pyrhomelas, N. leuciodus, Nocomis leptocephalus, Phoxinus oreas) from rivers of N. Carolina. 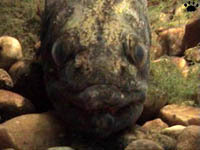 leptocephalus), Dan River, Virginia. 700 species of fishes from 40 families can be seen by snorkeling in rivers, lakes and swamps of the East - the most diverse non-tropical freshwater ichthyofauna. About 100 species are already extinct or endangered, but local freshwater diving sites are still among the World's best. Sunfishes (Lepomis gulsus, Enneacanthus gloriosus, Elassoma evergladei) from lakes of Georgia. Lake Ontario, Ontario. In some small rivers of the Appalachian foothills you can see more than thirty fish species in one hour of snorkeling. Various species of darters (Etheostoma, Percina) from rivers and lakes of the Carolinas, Tennessee, Kentucky and Missouri. Most of these pictures are close to natural size. 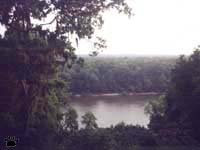 Mississipi River, Tennessee. 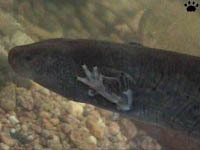 Some of North American freshwater fishes are "living fossils", such as gars, bowfin fish, and sturgeons. These relicts are not neccessarily shy and humble creatures: alligator gars may exceed 3m (10') in length. Blue catfish (Ictalurus furcatus), Missouri River, Iowa. These giants are now very difficult to see underwater, but huge catfishes can still be found in many rivers and lakes of the East. Paddlefish (Polyodon spatula), Mississipi River, Tennessee. Longnose gar (Lepistoteus osseus), Cape Fear River, N. Carolina. Paddlefish, Mississippi River, Tennessee. Upper Missouri River and slow-flowing channels of Mississippi still contain some large fish, but finding a place with water transparent enough for diving takes some time. Yellow perch (Perca flavescens), Lake Ontario. Shovelnose (Scaphirhynchus platorynchus) and pallid (S. albus) sturgeons are particularly difficult to see in the wild. Walleye (Stizostedion vitreum), Lake Superior, Michigan.